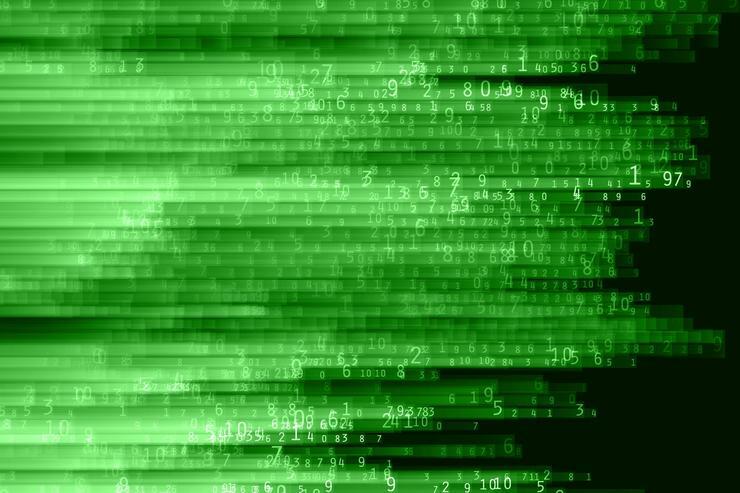 Irish Minister for Business, Enterprise and Innovation Heather Humphreys - accompanied by 71 Irish companies from the fintech, medtech, high-tech construction, agritech, emerging technologies and ICT sectors - announced the deals. “Australia is a mature and highly developed economy that offers significant opportunity for Irish exporters,” Humphreys said in announcing the deals. 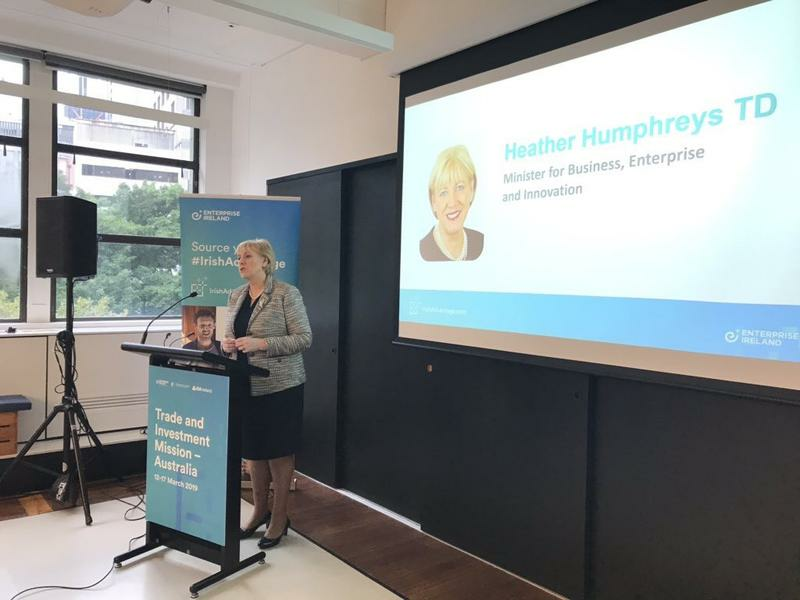 Humphreys said the deals - and the opening of the Melbourne office of Enterprise Ireland - are a direct result of continued growth in export to Australia and New Zealand from Ireland to the sum of $404 million last year - an increase of 43 per cent over the past three years. - Kingspan Insulated Panels announces a $8 million capex investment for a new state-of-the-art machine that will operate at its factory in Greater Western Sydney. -Solgari and Barhead strike a deal to bring Solgari’s Dynamics 365 All-Channel Solution to Barhead Financial Service & Retail customers in Australia. The partnership gives Solgari access to Microsoft’s global partner network and millions of potential customers. -Emydex announces a contract with Harvey Beef, the largest meat processing company in WA, to provide its food processing software. -Eppione announces a contract to license oits software to HR consulting firm Talenting. -Combilift announces a contract with E Store Logistics, which is set to become the second largest user of the Combilift Aisle Master product and largest private user across A/NZ. Humphreys said 320 Irish companies are now exporting to Australia - companies that employ over 25,000 people in Ireland. “Our ambition is to grow client exports to $574 million by 2020. I am delighted to lead this Trade and Investment Mission to Australia and engage in an extensive program of activity which focuses on supporting Irish companies to expand exports into this significant market," Humphreys said. 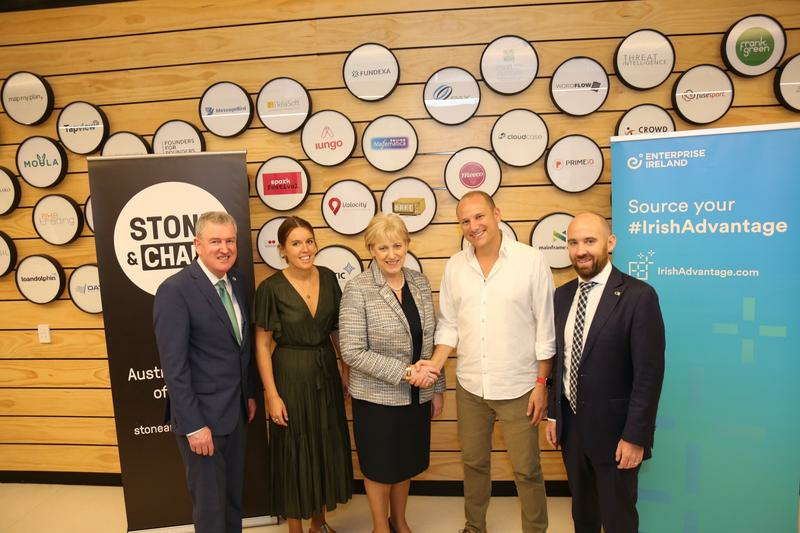 At the same time in related news, Stone & Chalk has inked a partnership with Enterprise Ireland in a bid to give Irish fintechs the use of its Sydney and Melbourne hubs as landing pads to accelerate market entry. Caption: L to R – Kevin Sherry, Executive Director, Enterprise Ireland; Hannah Fraser Fintech Manager A/NZ, Enterprise Ireland; Heather Humphreys, Irish Minister for Business, Enterprise and Innovation; Alex Scandurra, CEO, Stone & Chalk and David Eccles, Director A/NZ, Enterprise Ireland. “For innovation to thrive, we require more than just a room full of computers, a few motivational posters, and a common Wi-Fi,” said Stone & Chalk CEO Alex Scandurra. “We need to bring together all the different parties on either side of the supply/demand model within the one mutually-beneficial ecosystem – including from across international borders. “The partnership with Enterprise Ireland will create a highly valuable bridge between Ireland and Australia." As Stone & Chalk residents, Irish ventures will join its marketplace of 27 Australian and international corporate partners, and over 650 entrepreneurs working in over 100 start-ups and scaleups. Irish fintechs will gain access to Stone & Chalk’s corporate and government partners, and its mentor and investor communities, who've helped start-ups and scaleups secure over $320 million to date, Scandurra noted. Enterprise Ireland is considered the third largest VC in Europe by deal count, investing $37 million into 132 Irish start-ups in 2018, and has a portfolio of over 200 financial services and fintech firms. Humphreys, who welcomed the new partnership, said Ireland is expanding its global footprint - particularly in the Southern Hemisphere and Asia Pacific region - through increased investment in international offices, travel connections and building partnerships such as this one with Stone & Chalk.